About three weeks ago I stood in Hobby Lobby hoping I could find someone to help me sew the material I was about to buy so that I could make cushions for my church bench. I think you followed me in trying to paint the bench purple without sanding it down first. I'm lazy that way, and it's certainly not my best paint job given the paint really didn't stick well. 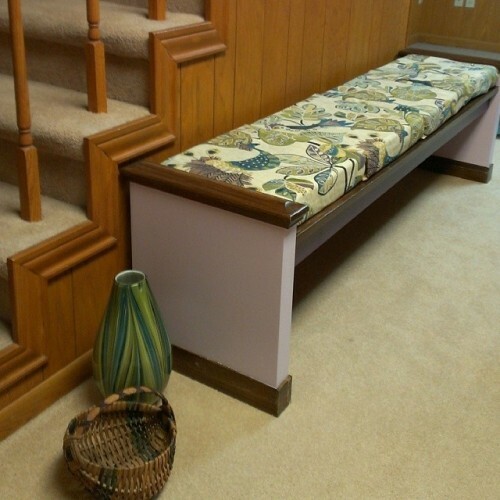 However, none of you are surprised that I painted the formerly white sections of the bench that came out of the Westhill Church of Christ auditorium purple. I left the stained wood the way it was. The wife of one of our elders (Billie Thomas) volunteered to help me out when others weren't sure of the tapestry-like fabric I described. I measured, cut, and pinned while she sewed. Other than her machine not liking my upholstery thread, we really didn't have any problems. Oh, except Thursday evening when I took hold of the machine for 5 minutes and broke the first needle. It may have been that I tried to sew too many layers on some corners, but I think it was the thread since Billie discovered my thread was not very compatible with her machine. It was jamming the machine. 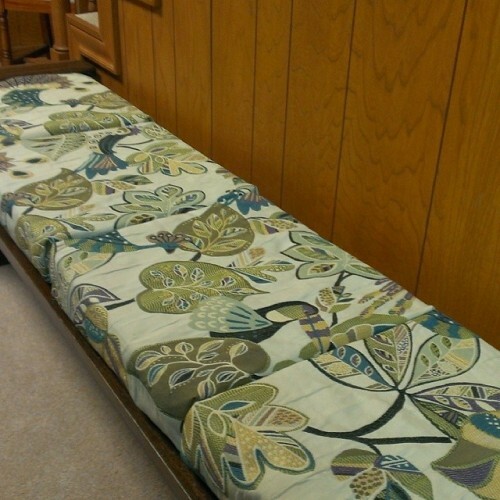 This afternoon, we finished the sewing off, and I have cushions for my bench! And curtains! 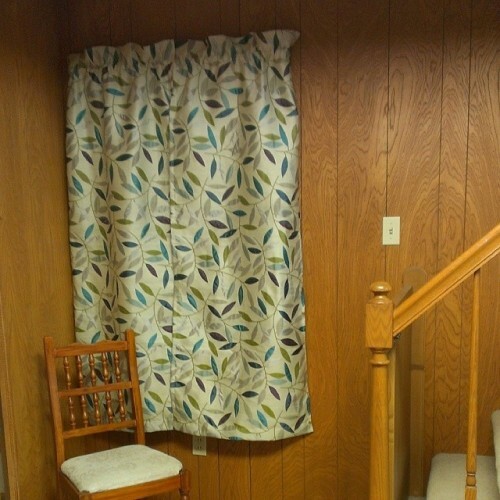 I have curtains in a complimentary fabric for the window at the bottom of my stairs. Admittedly, the length was determined by the fact that I bought two yards of fabric and was going to make them whatever length worked with two yards. All I need to do is finish tacking the openings on the bottom of the cushions. I made them like pillow shams, but the openings aren't all in the same place because I was trying to get certain birds on certain cushions. Thank you Billie for helping me out! I just wish the camera on my phone showed true colors.